A Credit Score is a three digit number ranging from 300 to 900, which signifies your creditworthiness based on your credit profile and past repayment track record. I allow MyLoanCare.in to access my credit information from Credit Information Companies (Experian) in order to understand my creditworthiness and curate personalized values for me. I hereby consent to and instruct bureau to provide my credit information to me and MyLoanCare on a monthly basis. I allow MyLoanCare.in to retain a copy of my EPF Statement. I authorize MyLoanCare.in and its third party agents to contact me regarding offers on loans, cards and other financial products and this consent overrides my number being in NDNC registry of TRAI. Personal information : Your name, address, employers. Accounts : Payment history, current outstanding and repayment track record of credit cards, mortgage loans and all other credit accounts. 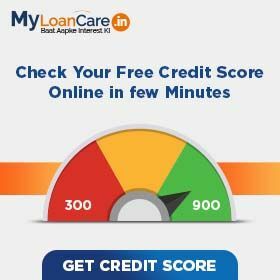 How to check credit report at MyLoanCare? 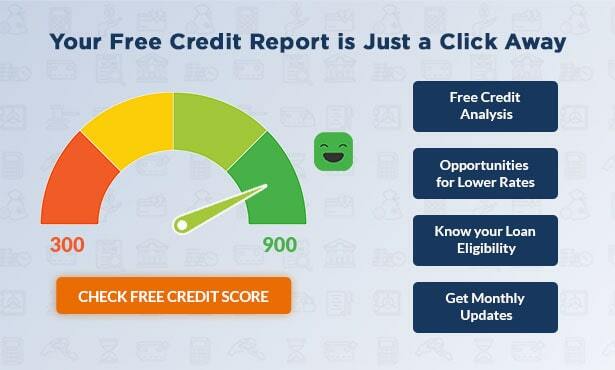 Step 1 : Visit myloancare.in and click on ‘Free Credit Score’. Step 2 : Enter your personal and employment details along with your PAN Card number. Step 3 : You will receive an OTP on your registered mobile number. Step 4 : Enter OTP and you will get your FREE Credit Report. Make sure your credit report is accurate : Checking your credit score can help you check if information reported in your credit report is accurate. In case there is any error, get in touch the credit bureaus, lender bank or credit card company to get it rectified immediately. Keep the hard enquiries at bay : Every time you apply for credit, the lender sends a request to the credit bureau to check your score. This is termed as ‘hard enquiry’. Frequent hard enquiries and enquiries that keep getting rejected gives an impression that you are credit hungry and have been struggling to get the loan you require. On the other hand, when you check your score for your own understanding, it is just considered as a ‘soft inquiry’ and has no impact on your credit score. Get better interest rates : Banks offer better interest rates to loan borrowers with a good credit score of 750 and above. Knowing your score before applying for credit gives you the ability to negotiate for better interest rates with your lender. Avail pre-approved offers : Fintech companies not only allow you to check your credit scores for free but have pre-approved offers for various loans for different ranges of credit scores because of their tie-ups with various lenders. You can also compare the offers available from different banks and pick the best one. How to read Credit Report at MyLoanCare? Credit Score : You can check your credit score and the factors that affect your credit score. Credit score determines your eligibility to get a loan and ranges from 300-900. Report Summary : In report summary, you can check the number of credit accounts, current balance amount and credit enquiry summary. Credit Account Information Summary : In this section, you can check the summary of all your credit accounts found in the credit bureau database such as number of loan accounts outstanding amount, nature of loan and date of opening. Credit Account Information Details : In this section, you can read the detailed information of your active loan or credit card accounts provided by your partner banks or financial institutions. The detailed information will contain personal details, account details, payment history. You can check if there are any delayed, missed or overdue payments reported in your payment history. In case of any incorrect information, get in touch with your bank as this information can hamper your credit score. Credit Enquiries : In credit enquiries, you can check the name of credit institutions that have processed a loan or credit application for you. Each credit enquiry harms your credit score. High number of credit enquiries and rejections in a short period of time are considered as high risk for the lender. Non Credit Enquiries : You can check the authentication requests and request for your Experian Credit Score & Credit Report by you in non-credit enquiries section. Get your credit reports corrected : If you believe that your credit score is low due to a wrong reporting by your bank or the credit bureau, get it corrected by contacting them. Keep a tab on your credit score at regular intervals to ensure that the corrections are getting reflected in your report. Inaccuracies may be due to wrongly reported payment conditions, misstated personal information etc. Make payments on time : Paying your dues on time is an important part of your credit score. A late payment will lower your credit score and can adversely impact it for several years. Keep your balances low : It’s advisable to use a credit card only for emergency expenses and pay off the balance as soon as possible. In addition, keep your debt below 35% of the total available credit balance. If your debt surpasses this limit, it reflects negatively on your credit report. Get the right mix of credit accounts : You must have the right mix of credit accounts. If you have only one type of credit account, your score may be lower. For example : Secured loans like home loans or car loans improve credit score as they build long-term appreciating assets, while having a higher proportion of unsecured loans such as personal loans, credit card debt, etc. can have a negative impact on your credit score. Avoid applying for new credit too often : Applying for a new credit account frequently can have a negative impact on your credit score. This includes applying for loans, credit cards and other forms of credit. When lenders see numerous applications within a short period, they consider you credit-hungry and your application might get rejected. You can visit MyLoanCare.in to get your free credit report. Just enter few basic details such as name, address and PAN card number, and you will get your credit report in just a few seconds. How do I obtain my credit score for free? You can obtain credit score for free by visiting the website of leading fintech lenders such as MyLoanCare. You just need to enter some basic personal and employment details to get your free credit score. You can raise your credit score by paying your credit card bills and EMIs on time. You should keep your credit card utilization below 35% of the total available credit card balance. Plus, you should not apply for a new loan or credit card frequently. A bad credit score is usually the result of not paying your dues on time or not paying it at all. An individual with a credit score between 300 and 599 has a significantly damaged credit history. Borrowers with credit scores that fall in this range have very little chance of getting new credit. A credit score of 700 and above is considered ideal to get the loan. You may get the loan easily and at better interest rates. Does pulling your credit report hurt your score? When you pull your credit report without applying for a loan at the bank, it is just considered as a ‘soft enquiry’, and has no impact your credit score. Your credit score may have dropped due to these reasons. So, identify the reasons why your credit score are lower and correct it.